When I was a young staff member with Campus Crusade, a few of us had the privilege to spend time with Walt Henrichsen. Those were formative times as many of us look back to those days with fondness and deep appreciation for not only Walt’s friendship but how he shaped our thinking. I remember hearing Walt telling us the value in reading liberal scholars. It went something like while the evangelical scholars can tell you what the text means, the liberal scholars better understand the complexity of people’s lives and the complexity of their hearts. So my expectation in going to see Exodus, done by Sir Ridley Scott, who acknowledges his agnosticism, was not for an exact re-telling of the Exodus story but to understand how an agnostic might approach a watershed moment in time and space, like the freeing and exodus of God’s chosen people. So be warned… there’s spoilers to follow. We went with two friends, Brad and Shannon, after the movie to gnaw on some chicken wings and talk about what we just watched. I was very hopeful when the movie’s introduction moved me – after 400 years of slavery, “God had not forgotten them.” There is something about this story in the history of Jews that needs to be told over and over again! 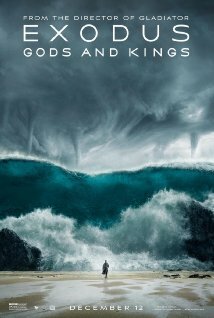 The plot generally follows the narrative arc as laid out in Exodus (no, there’s no rock people from Noah..). Scott takes some liberty with places in the biblical narrative where there’s silence and in other places he veers, sometimes wildly from the biblical story. It was the times he veered badly whee it began to become clear about Scott’s beliefs about God and faith. So for instance, he takes liberty with God’s interaction with Moses. While I was intrigued with God being represented as a boy (instead of the booming voice or even Val Kilmer’s deeply hollowed whispery voice in Prince of Egypt), there were a few parts of their conversation that became troubling. Scott’s views on religion as a whole are summed up in his Esquire interview where he attributes the biggest source of evil in the world to religion (Ridley Scott interview). God seems to be like a child so that when he is challenged by Moses, he erupts into anger. But even worse, it portrays God as waiting 400 years to pay back the Egyptians for their injustice with his own anger and revenge. At some level, in Ridley’s thinking there is no difference between gods (God) and kings (Pharaoh). They are both unreasonable. Another example of the veering is the conclusion. I’m not sure what Scott was thinking by trying to resolve the brotherly tension as the gigantic waves of the Red Sea are about to come crashing down on their heads. It’s almost as if he needed to veer from the biblical narrative to keep the story fresh. In the end, it really does violence to the Hebrew Scriptures that speak of Pharaoh’s and his army’s demise in the waters. The fact that both survived was not only unbelievable but corny. I really don’t think my Jewish friends will like the movie. As I said, it’s like having someone tell a clearly Jewish story in very non-Jewish way. I got a few laughs when I called this a Gentile’s take on the Exodus story. Again, there are a few parts done well (the lamb’s blood but even that was too short) but I wanted more depth exploring the condition of man and the horrors of being enslaved as a people group. I didn’t want “Moses the insurrectionist” as he trained his team of people to fight the Egyptians. Where Christian Bale got the idea that Moses was a terrorist, I have no idea (Bale interview). By the way, how did the Hebrew slaves even find the time and space to practice “how to overthrow” the Egyptian government? I guess I wanted a bit more respect for how important this was in the history of the Jews and not make things up taking away from the story’s tension and arc. On a personal note, the scale of Memphis, the plagues (I’m not sure about giant crocodiles but I’ll let it pass because it looked cool), and the Red Sea added to the experience thanks to the special effects However, I think the casting of Christian Bale seemed wrong. I felt like I was watching Terminator Salvation again but in a different place and time. Bale’s portrayal of Moses felt like he was emphasizing too much reluctance. While you certainly pick up Moses’ reluctance at times to speak to Pharaoh in the Exodus narrative, Bale went too far in creating a character that was much more reluctant and even more westernly individualistic than what we read about Moses. Would I recommend the movie? Yes, but remember that while it has moments, the movie is flawed. By all means, go and see it, but go home and read the account in Exodus. I think what you will find is that the Bible contains some seriously good stories that are more than just moral plays. Then read Hebrews. Jesus is the greater Moses: He is the one who ultimately leads His people out the ultimate slavery. He is the Hero who leads His people through the chaos of life into peace, or shalom.